I took the liberty of swiping the swell illustration above from Russell Beattie, the man who created it. Hope he doesn't mind. Russ used this picture to illustrate a problem he poses on his weblog. In an entry called Mobile Gadget Form Factors (which is a helluva lot less pompous than my title, but I had to come up with something), he points out that the ideal form factor is different for each of the functions a converged mobile device is supposed to serve. And he asks for ideas about how to solve this dilemma. I posted my answer over there (so if you arrived here from Russ's blog you might want to skip this). But my answer was so damned long, I thought I should grace my own blog with it. Especially since this is a question that I've been mulling over for some time. I agree that the form factor we seek has to be elegant - and that means the Motorola MPX isn't it (though it might be fun, if you grew up playing with, as you say, Transformers). It has to be well suited to each of its functions - meaning easy and intuitive to use, and ergonomically sound. I think four of the six essential functions you present would be equally at home in a landscape screen orientation - and it wouldn't necessarily have to be 16:9, just so long as it was wide-aspect. 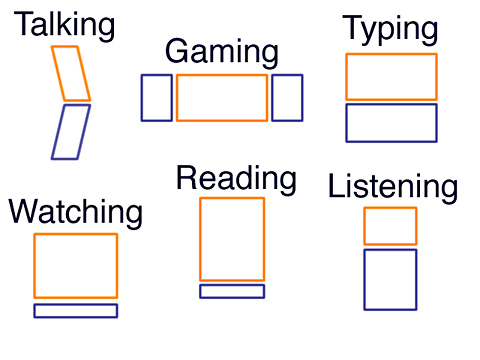 Those four functions are gaming, watching, typing - and reading. I really think that typing and reading, in terms of what your eyes do, anyway, are essentially the same. And I, for one, find it less fatiguing to read, say, two longer lines than three shorter ones. So this leaves us with two functions, listening and talking. Listening we can dispense with right away, because of course you'll be using headphones or external speakers. The important aspect of the form for listening (to audio) is the controls; the ease with which you navigate through files and control their play. But I'll get to controls, for all these functions, in a second if you'll bear with me. Talking, the final function, doesn't in my view require a flip form; but the ergonomics of it are certainly enhanced by something that is somewhat shaped to the face and ear, or at the very least not in conflict with them - and the various bricks and slates that mostly pass for smartphones right now obviously aren't it. The only form factor I can think of that comes closest to meeting these requirements is Sony Ericsson's P series - the 900 and 910. These devices are small enough to be pocketable phones, yet large enough to serve several other functions. I think the ergonomic problems with the P series can be solved with an OS update and a few hardware adjustments. You need to be able to operate the thing with one hand for most of its functions, obviously. And to change the screen orientation pretty much at will. And of course the QWERTY keypad on the 910 has to go. If you put an ergonomically enhanced QWERTY keypad on the *outside* of the flip, where it belongs - and either put the number pad on screen, or, combine it with the QWERTY, a la the Treo 600 - I think you'd go a long way towards making a usable device. For any real typing, you're going to use a Bluetooth keyboard, anyway, with the device in landscape mode. It might be helpful for music and gaming to add a navi-key type thing to the front of the device, putting it in or near the keypad (easier said than done, no doubt), or, perhaps on the *inside* of the flip, at least for gaming. Anyway, I think something like the P series is the form factor that holds the greatest promise of becoming one day the holy grail converged device.